Two identical rooms offer a place to explore two sides of a “mirror” — what is real and what is a construct. Yota Argyropoulou enters into a fictional world of emotional experience and invites visitors to follow her into action and inaction, detachment and connection. 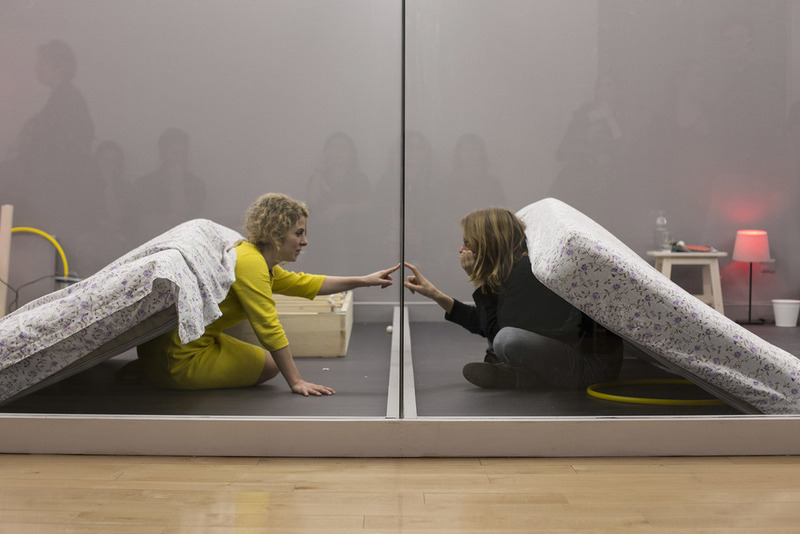 For eight hours each day and for seven weeks, one room will be her own truth, where time is suspended, a place of privacy “shattered” by the arrival of the real: the visitor in the other room. The glass between them isolates but at the same time invites communication, intimacy, and moments of genuine connection. Yota Argyropoulou studied Theatre Performance at Goldsmiths College and History of Art at UEL. She has performed in theatre plays in England, Spain, Italy and Greece, appearing in classical plays such as Ibsen’s “Hedda Gabler” (Hedda), Shakespeare’s “Hamlet” (Ophelia), Strindberg’s “The Storm” (Gerda), in modern plays such as Martin Crimp's “Attempts on Her Life”, and in performances such as “An Oak Tree” directed by Tim Crouch. She has appeared in feature films such as “Before Midnight” by Richard Linklater and “Luton” by Michalis Konstantatos, and in film installations such as “The Airport” by John Akomfrah. She is the co-founder of the “blindspot theatre group”, with which she performed in and contributed artistically to the following: “The Fall”, “Parklife”, “X-Tokio”, “Hedda Gabler” and “Hotel”, for which she also wrote the text. She collaborates with the director Michalis Konstantatos, and sign their projects jointly as “blindspot”. They conceived and designed this current performance together. She has also written art pieces published frequently in the press. The first play she has written — “Hotel” — was staged this year.